This week's Main Event was helped by two strong supporting matches, after the main attraction didn't quite deliver as I had expected. Main Event continues to be an entertaining hour of WWE television, and in allowing those wrestlers poised for the real main event scene in WWE, such as Cody Rhodes to experiment in these longer matches, they can only end up coming off better than when they entered. With a highlight package of Paul Heyman and Curtis Axel's attack on CM Punk on Raw starting the show, the Intercontinental Champion was in action against Cody Rhodes. This was a rematch from last week's Smackdown, where Axel got the victory following some distraction from Paul Heyman, so I was interested to see how this one would go, especially with Axel and Heyman now booked in a Handicap Elimination Match with Punk at Night of Champions. It seemed odd that the commentary team of Josh Matthews and Alex Riley didn't really mention the match they had on Smackdown, which would have allowed them to build up the contest more and make it feel more important for Rhodes to get his victory back, instead they focussed on the build to Night of Champions, making this bout feel pretty inconsequential. Similar to the match on Smackdown, this one wasn't particularly anything special and I think the extra time it was given actually hurt the match. Rhodes is taking longer to adjust to his current face role, than I originally expected and hasn't quite got the psychology of being a face down yet, a longer period of holding Axel in a chickenwing was not going to help the crowd get behind him! After a nice period of amatuer style wrestling at the beginning, things did look promising for this contest, but it quickly fizzled out. Axel looked good in control, with his slow methodical approach picking Rhodes apart, but what was needed was a pacy comeback from Rhodes, which really would have got me interested in the bout. This however didn't really come, as when the time came for Rhodes' comeback, he was visibly winded, after a good looking Diving Moonsault. It was a shame really that conditioning played apart here, as this match could have worked extremely well. Rhodes is definitely going to need more of these longer matches to build his conditioning for a potential main event push. The ending of the bout saw Rhodes trying to drag Axel back to the centre of the ring, but Axel holding onto the ring apron. The referee tried to get Rhodes to move away, only for Axel to hit a duo of kicks, one to the gut, one to the face, before jumping to his feet and hitting the Hangman's Facebuster for the pinfall victory and to go 2-0 over Rhodes. It was a bit of an “out of the blue” ending and seemed to come out of nowhere, blink and you'd have missed it. It was good however, to see Axel pick up a victory without having to rely on Heyman, who was pretty much a non-entity at ringside, as that was the main problem with Axel's match with CM Punk on Raw, without Heyman at ringside Axel never seemed like he could win, this will go some way to making Axel look like a more legitimate competitor in his own right. So, with Axel heading to Night of Champions already (as you'd expect, him being Intercontinental Champion and all) where does that leave Cody Rhodes. A month ago, Rhodes was closing Smackdown with his Gulf of Mexico segment with Damien Sandow, now it feels like Rhodes is back to treading water. I'd suspect Rhodes will pick up on his feud with Damien Sandow at some point, but if WWE are planning for the two to be feuding over the World Heavyweight Championship, then why are they having both lose these kinds of matches? Yes, Axel needed a big win heading towards Night of Champions, but there are plenty of others that could have been thrown into this bout, that WWE don't seem to have any plans on having in their World Heavyweight title picture anytime soon. 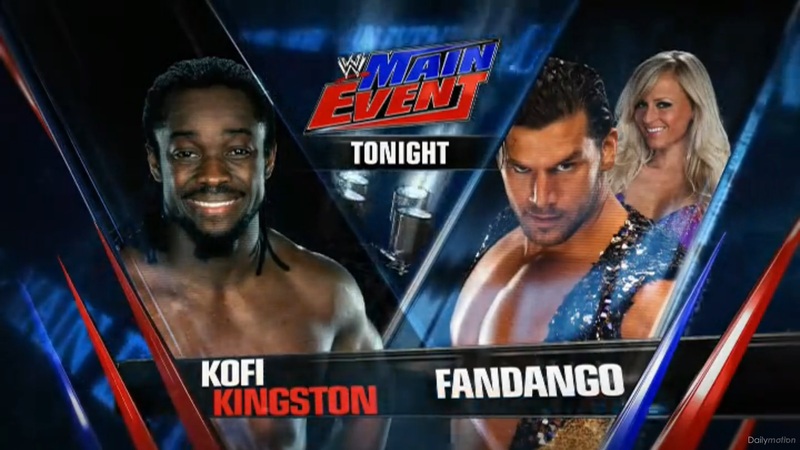 Elsewhere on Main Event, Kofi Kingston was in action against Fandango in what was essentially a rubber match for their series, with the two picking up victories over each other at the start of the month on Raw and Smackdown. This was by far the longest match the two have had on television and they were clearly relishing the opportunity. The match was quick paced from the lock up, but really got going with a nice spot, that saw Kingston land on his feet off a monkey flip from Fandango out of the corner, and go on to land his own version of the move. Both men had spells of control, with a number of quick paced reversals along the way, Fandango looked incredibly comfortable in control and you can see he has improved a lot since his days as Johnny Curtis on NXT. With Kingston making the comeback that Rhodes' needed to make earlier, hitting a Boom Drop and building for Trouble in Paradise, the match was strangely cut short, when Summer Rae grabbed Kingston's leg and the referee called for the disqualification handing Kingston the victory. It was odd because both Kingston and Fandango continued to wrestle and everyone looked very surprised by what had just happened, it certainly felt very sudden and definitely wasn't the satisfying ending that the bout needed. Hopefully, they'll have a rematch soon, so we actually get to see the ending of the bout. Kingston's comeback from injury has been pretty disapointing, he's quickly been relegated to Main Event and Superstars, and this entertaining match will hopefully remind WWE that he still has something to offer, I'd much rather see Kingston feud with Fandango than The Miz! There was also tag team action with Prime Time Players taking on Jack Swagger and Antonio Cesaro of The Real Americans. We've seen these two teams have a rivalry of sorts over the last two weeks, with a number of technically sound matches all won by members of the Prime Time Players. This was more of the same, with a basic yet entertaining contest. Cesaro and Swagger looked good working over Darren Young, before the hot tag to Titus O'Neil. O'Neil is great in this role, as he looks really impressive when ploughing threw his opponents. His Fall-Away Slam still impresses me, he seems to do it with ease. The finish saw both Young save O'Neil from being pinned by Swagger, with Cesaro taking out Young with a nasty looking dropkick, before Swagger walked straight into Clash of the Titus and with Cesaro unable to make the save, Prime Time Players picked up the pinfall victory. Hopefully, both teams feature in future plans for the Tag Team Championships, with a tag team scene which is really coming to life lately, although I'd much rather see Cesaro in singles competition. 1. Cody Rhodes needs to be working longer matches and picking up more wins, if WWE expect him to be a convincing main event competitor. 2. Kofi Kingston's return has produced nothing, but a costume change. 3. Alex Riley is actually quite informative on commentary, when he isn't talking about The Miz.